"I have a master's degree and my major is mathematics, I have even had some predoctoral studies, but I never had a single course in real statistics." 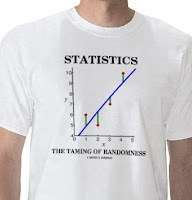 Statistics and probability underlie things that we use every day, e.g. google search, efficient micro-processors, insurance. Differential calculus alone is quite insufficient for any of the above modern scientific fields. The real problem is that the theory of mathematical statistics is actually somewhat harder than the calculus - understanding the calculus is really a pre-requisite to understanding mathematical Statistics. Consequently at a high-school level the temptation is to teach statistics in "cookbook - recipe" form without giving any explanation of the underlying theory. "something as vague as predicting the future"
This statement really betrays a simple lack of knowledge. To take an example, it may be very hard to predict when a specific individual is going to die, but we may be able to make very accurate predictions about what proportion of people in a certain population are going to die. for several hundred years we have been able to predict with great accuracy what proportion of births lead to males vs. females. I think your post actually serves rather well to illustrate what Arthur Benjamin is saying. Incidentally, you maybe interested to know that Sudoku puzzles may be solved easily via probabilistic Markov chain Monte Carlo algorithms, and further these puzzles are closely related to the theory of experimental design in statistics. Actually your comment shows I was not very clear in my post. I think what you need to teach the students in school is the basic tools and leave the applications to the higher education when the students understand the limitations. Mathematics has actually two different schools of scientists, the pure math and the applied math. I feel like a mathematician lost on track to become a teacher but my field is the pure math, combinatorics, number theory, coding theory etc. I prefer the applications which have exact answers which also has applications like RSA coding. If the other scientists don't have enough knowledge about the basics and limitations, the results can be disastrous. In Finland in the University of Turku Statistics is part of the social studies and the math they are using is not expressed the way I would need it to be. That is the reason I never studied it, expect as a part of the probability theory which covers as much as I need it, enough to show how much people using statistics really ignore the initial conditions and draw wrong conclusions. As for Sudokus, I am not interested in the fastest way to solve them. I am much more interested in questions like how many valid sudokus you can create, what is the minimum amount of clues needed and so on. These problems are hard. Since the amount of 9x9 sudokus is finite, these problems are a bit easier but the theory of nonograms and their solvability is in NP.